I finally had a chance to visit Vancouver last month, a city I haven't been to in more than 20 years (I blame the ridiculously expensive airfare). I spent one very chill week in and around Vancity just eating, drinking and hanging out. It was exactly what I needed; I came back home very well rested (7 lbs heavier!) and I didn't feel like I needed another vacation from my vacation (I hate that feeling). Anyway, researching which restaurants to check out naturally became my main mission before the trip. My final list consisted of around 7-8 places, with Hawksworth being on the very top of my list. Hawksworth Restaurant (Instagram: @hawksworthrest, Facebook: Hawksworth Restaurant) has received an impressive number of awards and accolades since it opened in 2011, some of which include Best New Restaurant from enRoute Magazine, Canada's Restaurant of the Year from Maclean's Magazine, Second Place in Canada's 100 Best list, Chef of the Year, Sommelier of the Year, and Best Upscale Restaurant from Vancouver Magazine Restaurant Awards, etc, etc. The list goes on and on (click here for the full list of awards). So, to say I was "excited" when my friend Mijune of Follow Me Foodie snagged a reservation there is clearly an understatement. 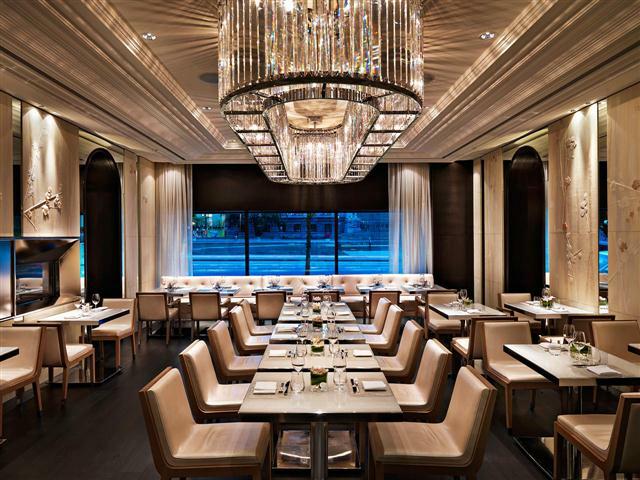 Located in the gorgeous Rosewood Hotel Georgia, Hawksworth serves contemporary Canadian cuisine. The restaurant's menu is seasonal and features local Canadian ingredients. We left it up to Chef de Cuisine, Chris Stewart, to feed us that evening. It's always better that way, trust me. Take a look at that iberico. Thinly sliced with a dark-ish red hue and some natural fat infiltration, the 48-month old iberico had a sharp flavour and an oily texture (amplified by the liquefied fat trimmings). The fried beef tendon puff had an intense crunch that quickly dissolved on the palate. Yum. I couldn't have asked for a better way to start the meal. Wine Director, Bryant Mao, leads the award-winning wine program at Hawksworth. Here is Bryant pouring Mijune and I our first glass. Buttermilk poached halibut, fresh peas, pea puree, pea veil, pea tips, pea powder, edible flowers, puffed rice. Pairing: Little Farm Riesling 2015, Mulberry Tree Vineyard, Cawston, BC. So much yes for pea season! Nothing symbolizes the sweet, light, and freshness of spring quite like peas. Underneath the velvety pea puree, the poached halibut was soft and flaky, and the puffed rice added just the right amount of texture to the plate (or bowl). Beautiful flavours, textures, depth and colour. This was a wonderful representation of the terroir of Vancouver, with land and sea uniting to form a perfectly made dish. Hamachi sashimi, smoked lardo, togarashi egg noodle, smoked uni and avocado puree, uni and mandarin sabayon. Pairing: Les Cretes Valle D'Aosta, Petite Arvine Valle d’Aosta D.O.P. They had me at hamachi and uni. What caught my eye, though, was actually the bowl of sabayon on the side. Sabayon, a custard-y Italian sauce traditionally made with wine, egg yolks and sugar, is usually a dessert or a dessert component, but here, it's a savoury sauce made of uni and mandarin. I liked how the uni brought everything together with it being in the sabayon, the puree with avocado, and in its raw form as sashimi. What I didn't care for were the egg noodles. Visually, I was hoping for something smaller and prettier. Practically, they were hard to pick up with a knife and fork; they kept falling off my fork and bouncing onto the table. I think something like puffed rice cereal would've worked better. Pickled beets and rhubarb, edible flowers, savoury granola, macadamia nut puree, black fruit leather, beet crisps. Gorgeous. This is not your typical beet salad. All the pretty flowers and vivid colours, I admired the plate for a very long time before digging in. I was really fond of the contrasting textures from the crunchy granola and the creamy macadamia puree. Unfortunately, the beets and rhubarb fell short; they were so over-pickled and sour they masked the taste of everything else on the dish. Chilled and seared scallops, yuzu dashi broth, kaffir lime oil, grapefruit, dehydrated and microplaned scallops, puffed bamboo rice, micro cilantro, fennel fronds. Similar to the halibut course, this screamed "Vancouver!" to me. Fleshy scallops with a tender, springy centre, these lovely bivalves were piquant to my taste buds (especially with the hint of umami from the dehydrated scallops). The cool and tart yuzu dashi with the puffed bamboo rice brought all the flavours and textures together so nicely. A perfectly executed dish. Humboldt squid, nashi pear, gailan, micro cilantro, pork vinaigrette, peanut nage. It is exhilarating to experience such excellent seafood, course after course. Are you tired of my love affair with seafood, yet? My apologies, but I can't help it, especially when it's so hard to come across plates like these in Toronto. Anyway, I digress! As the only type of squid recognized as sustainable by Ocean Wise, I realized just how much I like the Humboldt squid (I had a few more Humboldt squid dishes during my trip). The squid has a soft but firm texture, its flavour is mild, making it a great carrier for other flavours. Here, the crispy pork chili vinaigrette reminded me of a bold XO sauce, and with the crushed peanuts the plate exudes a punch of familiar Asian flavours. Really enjoyed this. Licorice crusted lamb saddle, fennel and stinging nettle puree, fava and white beans, allium flowers, lamb jus. I love lamb, especially lamb saddle since it's the leanest, tenderest and the meatiest cut. A stark contrast to the light seafood courses, this plate is rich (my mouth began to water at the sight of the lamb jus being poured table side). The aromatic licorice crust and the sweet fennel in the puree complemented one another beautifully, and the fava beans gave a slight buttery texture to the plate. Needless to say, the lamb was excellent as well. Not something I would normally order but I'm so glad I tried it (I never order chicken at a restaurant unless they specialize in it). Hawksworth knocked this comforting classic out of the park with the tenderest, most juiciest piece of chicken breast I've ever had. Pillow-y gnocchi in a rich black truffle puree and chicken stock completed the plate. A well done, very respectable "tribute" to a nostalgic dish. By the way, we sat in the main dining room, or the "Pearl Room", one of four distinct dining rooms at Hawksworth. To be honest, I expected the room to be more spacious. I find it to be a bit crowded for an upscale restaurant (i.e. I would hate to sit in one of those tables in the middle). A photo taken from the Hawksworth website which gives a better representation of how elegant and sophisticated the room actually is. That crystal-shard chandelier is stunning. Plum wine and cheese is such a fantastic pairing! It's my first time trying this pairing and I absolutely love it. Instead of pouring myself a glass of port with cheese I'll try some plum wine next time. Dulce namelaka, maple and walnut praline, aerated toffee, maple crumble, milk meringue, walnut, maple gel. Candy cap mushrooms have a very similar flavour profile to maple syrup, just not as sweet. It's wonderful in ice cream because both the mushroom's sweet and earthy flavours end up coming through very nicely. This was a delicious dessert with the perfect combination of textures (the difference in "crunch" from the crumble, walnut and meringue) and flavours, ranging from the least sweet (ice cream), to medium sweet (meringue), to sweetest (toffee). A tour of the kitchen after dinner. Here is Chef de Cuisine, Chris Stewart (@c1718), at the pass. 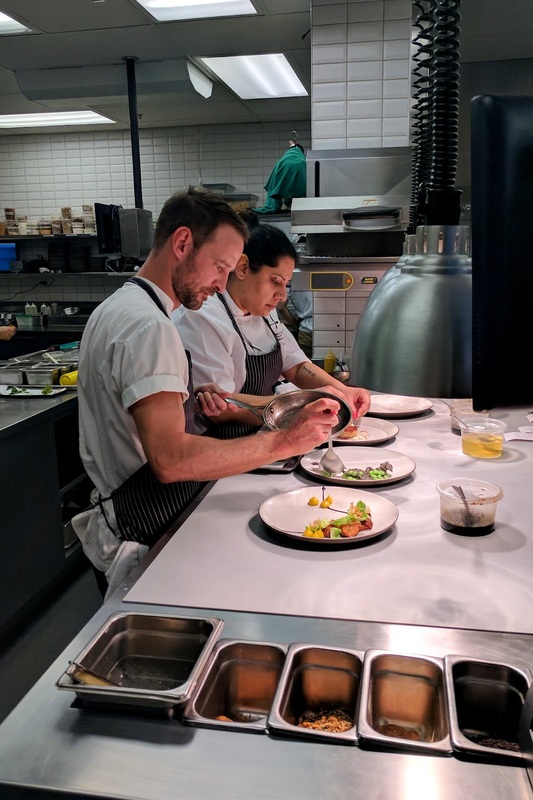 Fresh, local and seasonal ingredients rule at Hawksworth. Plates are deceptively simple, allowing seasonal flavours to shine, showing thoughtfulness and restraint. Overall, the menu is approachable, light, with hints of bold Far East flavours. The service that evening was gracious and accommodating, not pretentious at all. So happy to finally have the opportunity to dine at Hawksworth. I had high expectations going in and the tasting menu that night did not disappoint. If you ever find yourself in Vancouver, make sure you check it out.